I didn't think I could do as much as that, but I thought once a week I could brighten Monday's by posting a picture of a postcard from my collection. Along with a little explanation of the card. 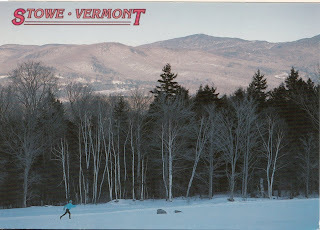 Today's card is Stowe, Vermont from a vacation that I took there in January of 1995 to go skiing. Unfortunately, no one told me about the "January Thaw" when the temperatures rise and there is hardly any snow. So we did not have much snow for skiing, but we had a great time none the less. Oh no, now I have pressure to keep it up every day. :) Thanks for the mention though! Nice idea...thanks for the day dream!! Not only did Sue & I enjoy this "virtual" postcard, we LOVE the real things that arrive in our mailbox from time-to-time! Thank you Amanda! These will be something nice to look forward to on Mondays. I love this postcard on Mondays idea, Amanda. Look forward to seeing them! Stunning pic, I've always wanted to visit Vermont.